Mrs. Maggie Lawrence has been with the Nashville Fire Department since August of 1985. 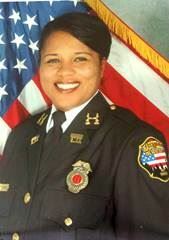 Now ranked as a Deputy Fire Marshal, she has worked in the capacity of an Assistant Fire Marshal, Fire Inspector, Fire Investigator, Public Information Officer and a Public Fire and Life Safety Educator. Mrs. Lawrence is certified as a Fire Inspector, Fire Investigator, Fire & Explosion Instructor and a Public Fire and Life Safety Educator, she is also a certified Mediator.